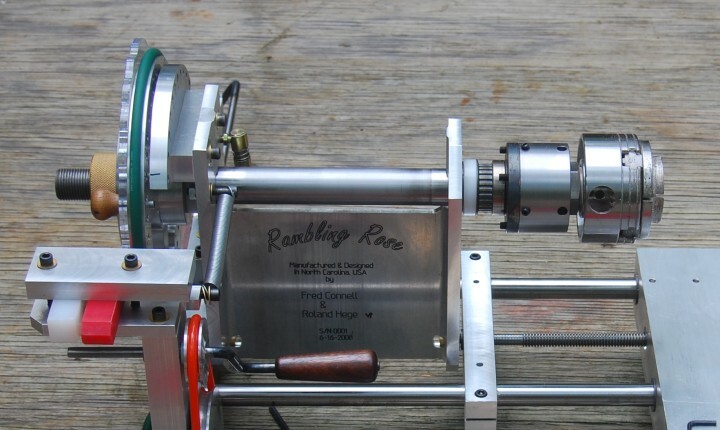 The headstock of the Rambling Rose Engine pivots on steel 60 degree points in brass sockets. Preload is adjustable. Plastic bearings assure long wear and minimum friction. The head can be locked in the central position for ornamental index work by a rod with a quick release ball joint fitting connected to the rear rubber rest. The spindle has a 0.5" through hole for a drawbar and the spider has a #2 Morse Taper (MT-2). The chuck adjusting spider back and thread cutting timing belt drive gear are heat pressed fitted permanently on the spindle. The index wheel is secured by a set screw which controls the preload on the main spindle bearings. We added 1/4" aluminum stiffner plates to each side of the web of the "I" beam headstock avoiding having to weld a custom headstock. This is a very stiff machine. The back end of the spindle is 1" diameter with 12 threads per inch for the brass nut securing the cam(s).